The year 2016 saw continued acceleration of threat evolution with pervasive threat actors conducting attack campaigns comprised of multiple exploit methods. The emerging quandaries in the security arena include strategic data manipulation and disruption, increased attacks on application service providers; hacktivism and the attack surface. RSA Security has taken a strategic shift from its focus on prevention towards a greater balance on monitoring, detection, and response capabilities, to effectively prevent advanced threat breaches. Over the past year, RSA has been repositioning itself, calling it business-driven security, and building a portfolio centered on identity and access management, threat detection and response, and governance, risk and compliance. RSA’s hosts of security solutions help organizations reduce the threat vector by providing increased network visibility, and threat analysis systems. Through RSA’s partnership, clients are able to identify, investigate, and respond to security threats effectively. To help CIOs navigate through the list of RSA security solution providers, our distinguished selection panel, comprising CEOs, CIOs, VCs, industry analysts and the editorial board of CIOReview narrowed the final 20 RSA Security Solution Providers that exhibit competence in delivering RSA techniques poised for mitigating the ever-evolving threats and the associated risks. 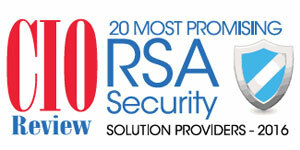 We present to you CIOReview’s 20 Most Promising RSA Security Solution Providers 2016.